Say so-long with so-lar! The Sol-Mate™ Solar Animal Chaser keeps unwelcome cats and dogs away from any protected yard. The wireless unit utilizes the power of the sun and is easily mountable on walls or fences. The state of the art solar panel charges the internal battery and guarantees a trouble free operation for up to 7 days, even in cloudy weather. The high pitched ultrasound frequencies are activated by an infrared motion detector. This noise is inaudible to humans but irritates cats and dogs. A built in strobe light, unique to this type of repellent, is also effective at warding off intruders. These deterrents work for 20 seconds after an animal triggers the motion sensor. Not only is this device relatively maintenance free, it is also cruelty free. 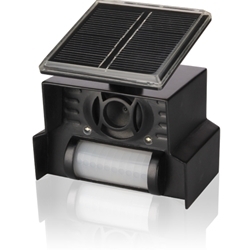 The Solar Animal Chaser is the perfect solution to keep roving animals from your property.